Posted in Birchbox, Hair Care, Makeup, Skincare, Subscription Box	Tagged Benefit Cosmetics, Birchbox, COOLA, dog parenting, donna karan, dr. brandt, la mer, micodermabrasion, nordstrom, nordstrom anniversary sale, Oribe, Roller Lash, Skincare, Stila, Texture Spray, They're Real! Receiving my Birchbox each month is like having my own little box of holiday surprises all year long! 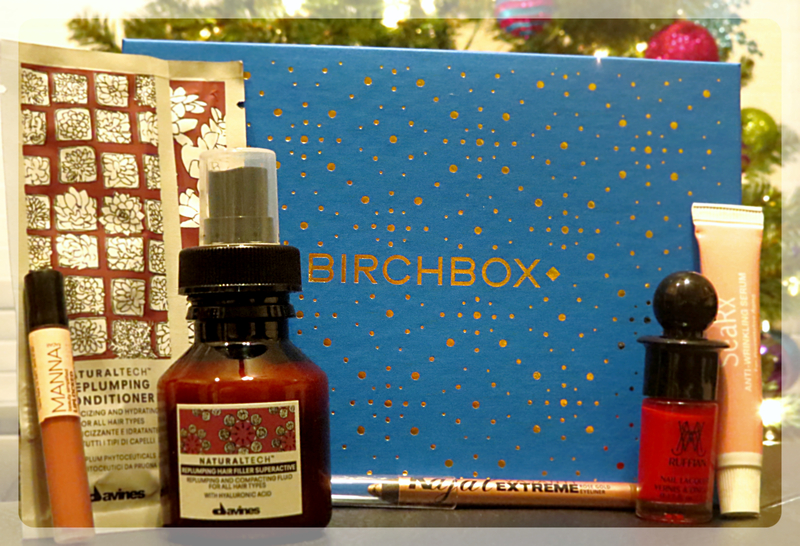 This month, Birchbox decided to forgo their signature pink box and sent my treasures in this festive blue holiday box. This was hands down one of the best boxes I have ever received. I ended up purchasing full-size versions of two of the items in the box. The best part is that I got them FO FREE. In addition to the 25% off promo code Birchbox emailed me, I was able to use my Birchbox points to purchase the full size items. The items I purchased were $42 in total, plus two bonus samples. I love this company because it is so easy to earn enough points to get free products! I have also racked up enough points to become an Aces member. What is an Aces member you ask? It comes with perks such as free standard shipping, concierge service, exclusive shop offers, anniversary perks, and surprises. I love surprises. I am not sure if it is a good or bad thing that I became an Aces member. I did not reach this level from just writing product reviews. I confess that I had to buy a few things as well. This is similar to how I feel about becoming a VIB member at Sephora this year. It sounds like a good thing, but in reality, I have probably spent entirely way too much money. Anyway, let’s get started on the samples, shall we? This lip gloss is now my holy grail lip color. This color is GORGEOUS and is appropriate for day or night. It also feels wonderful on my lips. The color stays put while moisturizing my lips, which is exactly what I need in this dry, winter-ish weather! This is one of the products I ended up buying. Love love love! I have mentioned before that anti-aging treatments are not my favorite sample to receive in these boxes. Sure it’s good to shlop some anti-wrinkle cream on around your eyes before bed. But when you only have a tiny tube of product, or just a single use packet, it’s impossible to tell if the product is actually working. Unless Birchbox finds a way to send me some instant plastic surgery in a tube, I probably will not be purchasing any of these kinds of products. THIS! This eyeliner, guys! Is it obvious that this is the other product I purchased? Because of course it is. This sample was a sample I was able to choose for this box. I typically do not go for eyeliner that is not black. Not since college, anyway. This color is excellent for using as an eye brightener. I line my lower lashline and tear ducts with it. I instantly look like I slept 9-10 hours instead of my usual 6-7! I love how awake this liner makes my eyes look. P.S. The full size liner comes with an awesome built-in sharpener! I wish there was a way for me to tell Birchbox that I do not want any nail polish samples. I don’t even touch them. If Birchbox was able to see how much of a horrendous nail biter I am, they would not deem me worthy of having their fancy nail polish samples. My boyfriend’s mom suggested I blog about trying to stop biting my nails. I think she is onto something because I would have a lot to whine about say on the experience. When I am ready, and when I am sure I will not fall off the wagon, I may give it a try. I have tried before, and not even that disgusting Stop Bite stuff could keep me from chomping away. Horrible. Anyway, for those of you who enjoy nail polish, Birchbox sends some awesomely sized samples. I have expressed my gratitude to Birchbox for sending me shampoo samples I can actually use on my keratin-treated hair. But a shampoo, conditioner, and leave-in treatment in the same box? Heaven. And Davines to boot, which is an excellent hair care brand. I use the Davines Alchemic Silver Conditioner to tone any brassiness out of my blonde hair. It works wonders, I tell you. I liked this shampoo a lot, but not enough to purchase it right away. I like to switch up my shampoo each time I run out, so will definitely put this one in the queue. The same goes for the accompanying conditioner. I am definitely willing to try it out in the future. I LOVE a good leave-in conditioner. I often feel like the conditioner I use in the shower will not be enough to protect my hair from all of the terrible things I do to it. This was a decently sized sample as well. It leaves my hair light and soft, without weighing it down. Luckily the sample will last me a while! If you are interested in receiving your own little monthly treasures, then pretty please sign up for Birchbox using my referral link!